Fields refer to pieces of descriptive information which the report pulls from your Operate. Measures or Calculated Fields are a type of field that contains numerical data and can be used for calculations. If you click the pencil icon next to your report, within the Advanced Reports section, you will be taken to the Report Editing screen, where you can adjust its configuration. 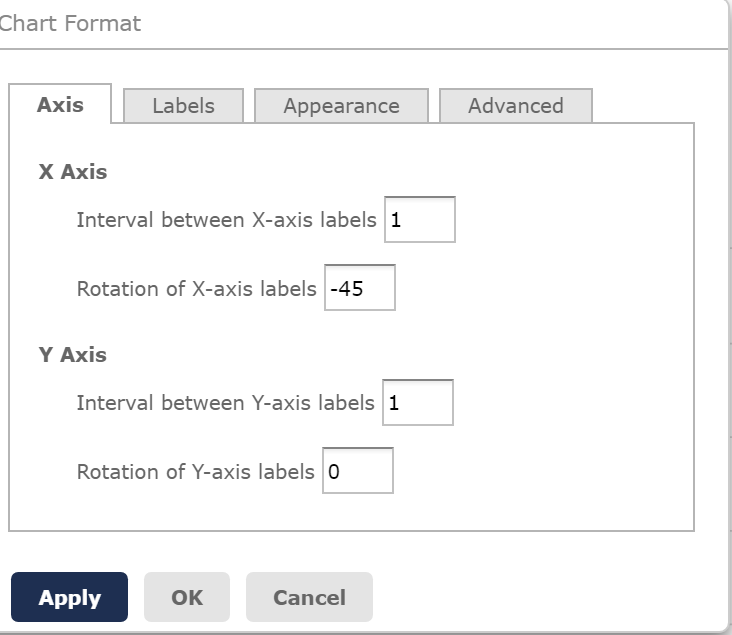 A panel to the left, where you can select Fields and Measures. The Report Preview, which also displays a toolbar and a list of fields/measures being used (the top one displays column fields/measures, while the bottom one displays groups/rows). 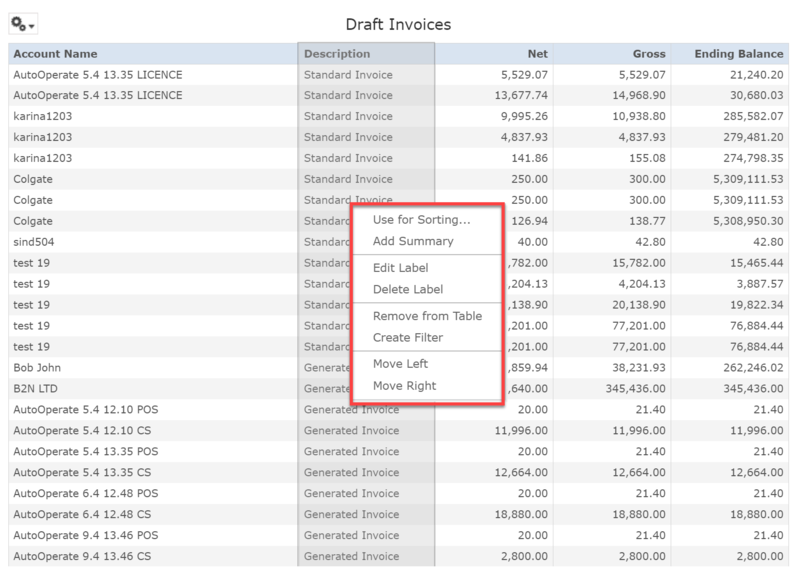 The Filters panel, which allows you to add and edit filters applied to your Report data. 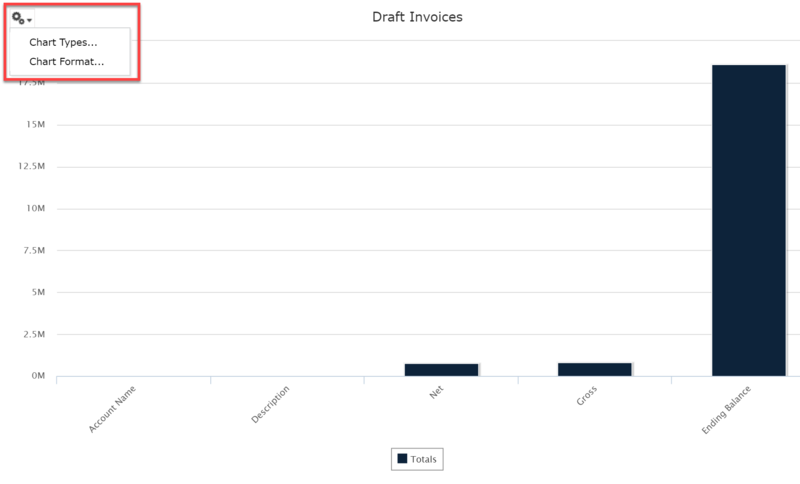 Your Report is built using descriptive and calculated fields. To use a field, you need to first make it available for the Report, then drag and drop it to either a group (row) or column. To make fields available for your Report, click the pencil next to your domain name, at the top left of the screen, then click Select Fields. This will open a new window, where you can select from a list of modules (Called Available Fields), then click the arrow to the right, which brings your field under Selected Fields. Do this for every list item you want to add to your Report. Click OK when you are ready. 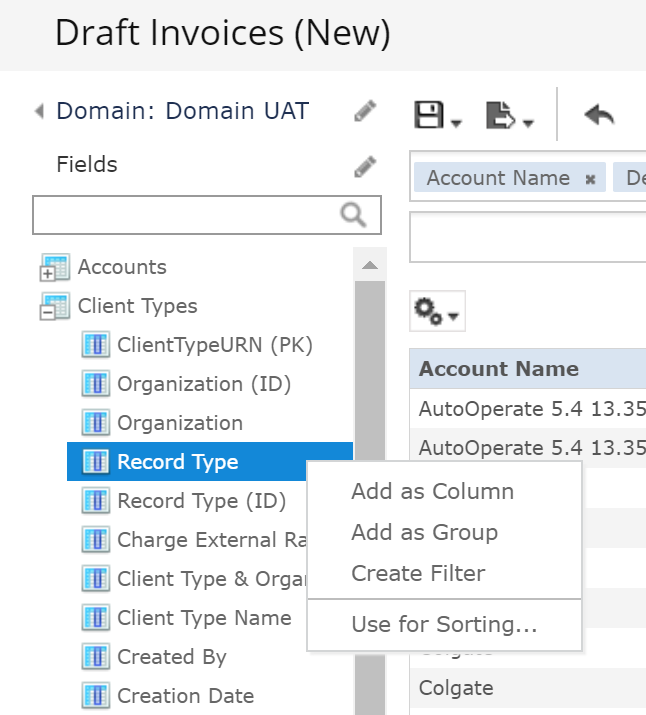 Each module will likely contain a set of fields, which you can right click and add to your Report: as a column, group, filter or sorting criterion. 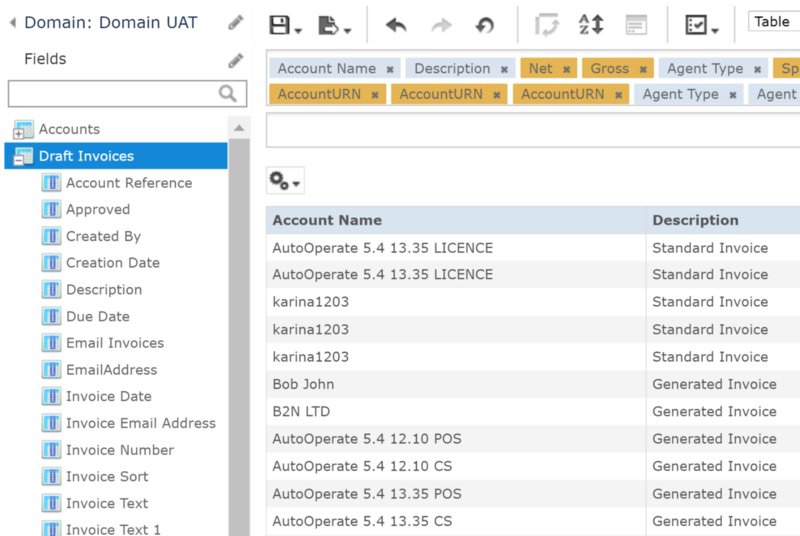 The Toolbar at the top of your Report provides a set of options you can use to manage the data that your Report has already pulled through from the fields or measures added previously. The toolbar changes depending on the selected report layout. The below example is from the Table layout, which contains the complete set of options. Save your Report - Save Ad-Hoc View will save over your existing one; while Save Ad-Hoc View As will create another report that includes your changes, while keeping the original one unchanged. Export Options - You can export your Report to: .pdf, Excel (paginated and non-paginated), .csv, .docx, .rtf, odt, ods, xlsx (paginated and non-paginated), .pptx. Switch Groups - This switches your column headers to row headers. Set Sort Order - This will open up a window where you can select certain fields based on which you can sort your data. Toggle the Title Bar and Layout Band - this button will turn these areas of the screen on or off, to make it easier for you to view larger reports that require more screen space. Switch layouts - you can display a Table, Chart or Crosstab (the equivalent of an Excel Pivot Table). Select Used Data - either Sample Data (useful when your repors are large) - your full data will be made available upon export - or Full Data - your Report will display the full data right away. 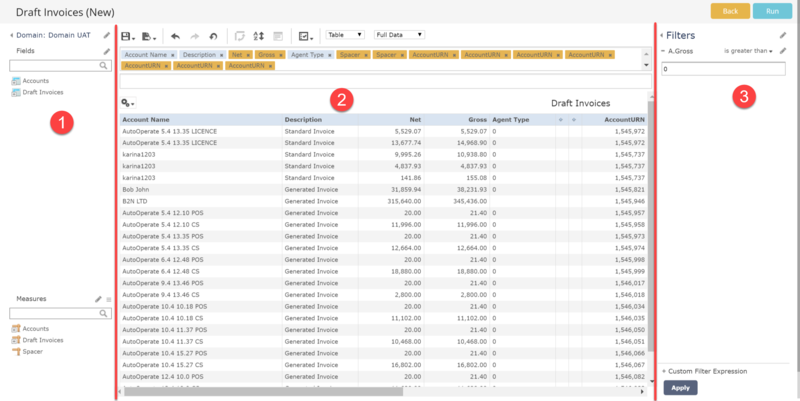 The Table Layout is the most complex view of your data, which shows it all on your screen (either sample or full, as selected on the toolbar above). Right click a column within your table to open an options menu that lets you use that particular column to sort your table by, add a summary (total) of its values, edit or delete the label/column header, remove the column from the table, create a filter based on it or move it left/right. The gear icon at the top left of the report view allows you to display detailed data, totals or both. When including totals, you will see an additional row at the bottom of your report which sums up the numerical values above. Selecting the Chart Layout allows you to view the report in the form of a chart, to which you can set a type and format. Use the gear icon at the top left to access these options. To switch between chart types, select the corresponding option from the gear menu, then choose from the available types. Your chart will automatically adjust and all you need to do next is close the types window as soon as you are ready to choose a specific chart type. 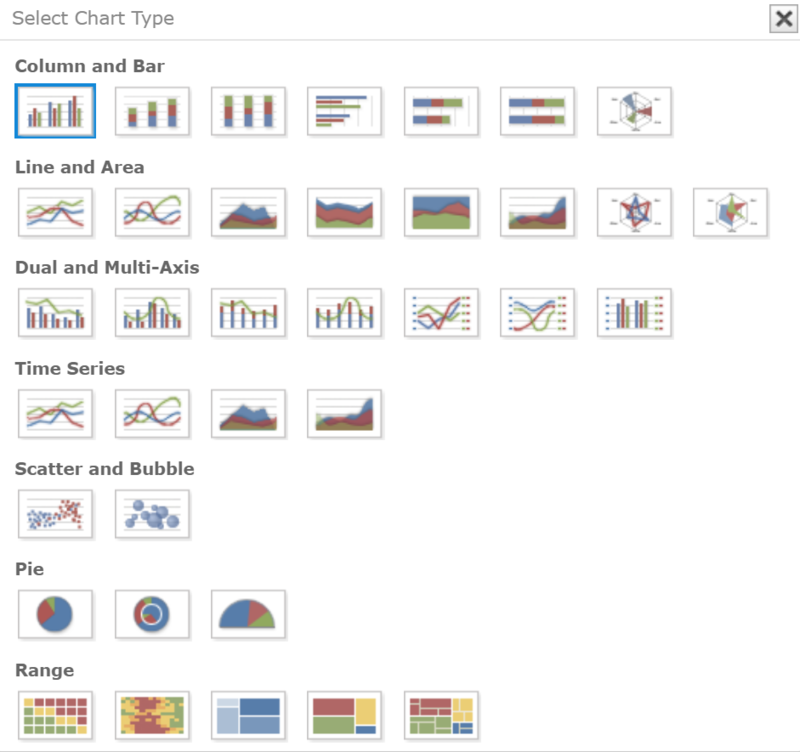 The Chart Format option lets you adjust different attributes of your chart, such as axes, labels, appearence, etc. A Crosstab is very similar to a pivot table in excel. It gathers your data points and creates a summary. 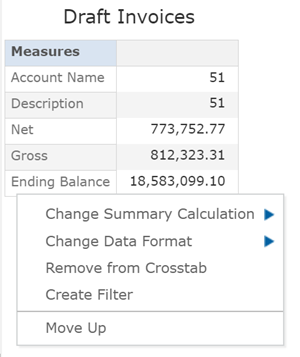 Right click your table for an options menu where you can adjust your summary calculations, change the data format, create filters, remove a line from the table or move it up. At the top of your report, you will see an area which contain the fields and measures added to it.. The top row contains column fields, while the bottom one contains group (row) fields. You can drag a field from one area to the other, but only while using the Table layout. 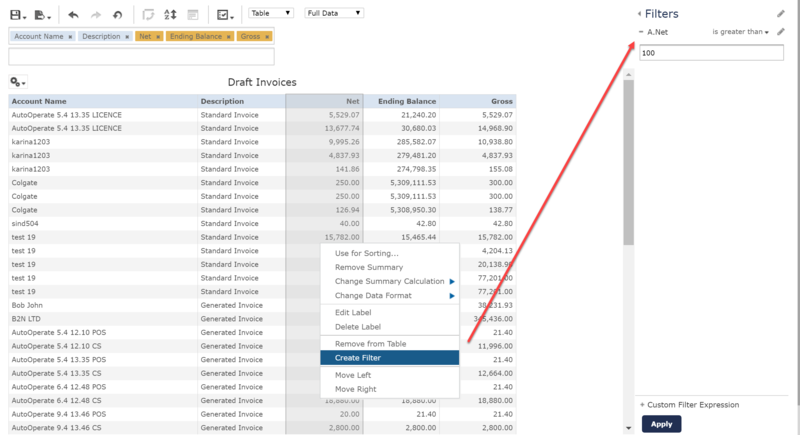 On the right side of the report editing screen, there is an area where you can add filters to narrow down your data. When you use the Add Filter option within a table or crosstab report, here is where you will see the new filter listed and available to make changes to. 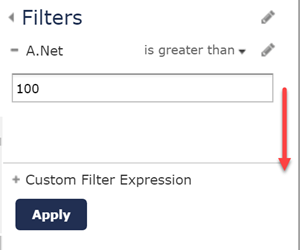 You can then set filter criteria and custom expressions. Click Run at the top right of your screen to immediately run your new report or use the toolbar to save your changes to the existing report or as a new one.